CLEVELAND – There aren’t very many running backs that have more receptions and receiving yards than Duke Johnson since 2016. In the former category, only Le’Veon Bell of the Steelers (160) and James White of the Patriots (148) have more catches than Johnson over the last three seasons. He’s got 137 of them himself. In the latter category, a measly 47 yards separates Johnson’s 1,298 yards from Rams tailback Todd Gurley’s top mark of 1,345 receiving yards. Meanwhile, in 2017 Johnson led all Browns in receiving with 693 yards – granted the lack of talent at wide receiver and putrid quarterback play had a hand in the 25-year-old’s dependency. Regardless, over the last few seasons, Johnson has become a staple in the Browns offense, particularly as a pass-catching running back. This year though that has change. Through five games in 2018, Johnson’s involvement has been minimal as he’s been on the field for just 41-percent of the Browns offensive snaps – down from 53-percent last season. On one hand, it’s not really hard to see why his snap count has dropped. 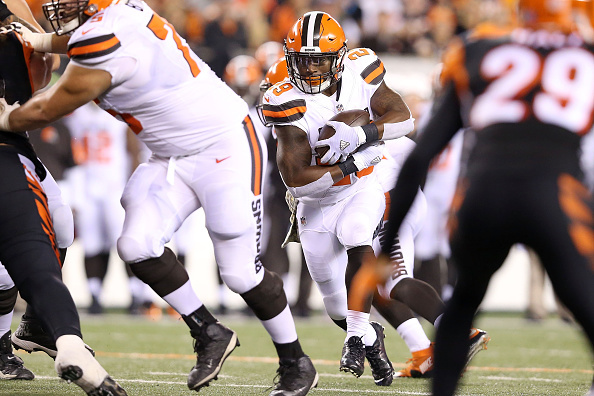 For once, the Browns have a surplus of talent on offense, particularly at running back where they signed Carlos Hyde in free agency and drafted Nick Chubb out of Georgia. An over exuberance of backs is a good problem to have, no doubt. On the other hand, did the Browns really give Johnson a three-year, $15 million extension to play 40-percent of the team’s offensive snaps? Doubtful. For comparison purposes, White has played more than 53-percent of the Patriots offensive snaps, already has 32 catches, 270 receiving yards and four touchdowns. In the same amount of games, Johnson has one-third the catches (10) and a meager 75 yards. Keep in mind that the Patriots often stow away five or six running backs on their roster and they’re still constantly finding a role for White. That’s an indictment on one of Hue Jackson or Todd Haley or some combination of both offensive minds, because they’re having a hard time figuring out how or when to use Johnson. And if we’re being honest, they’ve struggled with establishing roles for all three of their backs. Johnson’s lack of involvement is maybe the most egregious though, especially since the four-year veteran can be on the field without taking away snaps from Hyde or Chubb. Johnson doesn’t have to be restricted to the backfield. He can line up in the slot as well and did just that in numerous situations each of the last two seasons, particularly on third down. Using Johnson primarily on third downs is perfectly fine, but what’s the harm in mixing him in on first or second down as well, with either Hyde or Chubb at tailback? It certainly doesn’t hurt the offense to have more weapons out there. So on the eve of a Week Six matchup with the Chargers, a unique opportunity awaits Johnson and the Browns offense tomorrow. Cleveland is down a few wide receivers. Rashard Higgins – who has obvious chemistry with rookie quarterback Baker Mayfield – is out with an MCL sprain. Joining Higgins is his backup, Derrick Willies, who frustratingly broke his collarbone at practice on Friday. This is where Johnson can really earn his money and should carve out more of a role in the offense. There’s no reason Johnson shouldn’t be on the field for at least 50-percent of the team’s offensive snaps against Los Angeles and it really should be more than that. Good things happen when the ball is in Johnson’s hands. Time for Jackson and Haley to figure it out and take advantage of one of their most versatile weapons.